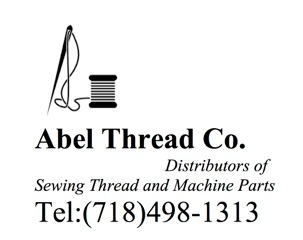 Abel Thread Co. offers the following Returns Policy: 30 day return policy on any item found to be defective. All items must be returned in original packaging, unmarked, and complete. Before returning you must receive a return authorization. You may receive a return authorization by requesting it via email. On items ordered incorrectly you may return for full credit (less shipping) at your expense within 30 days of shipping with the exception of machinery. All items must be in orginal packing and unused. ALL SALES OF MACHINERY ARE FINAL. THIS INCLUDES CUTTING MACHINES, BOILERS, VACUUM BOARDS AND MOTORS, AND HEAT PRESSES, ETC.If you have additonal questions, please e-mail abelthreadco@yahoo.com All emails will receive an immediate reply during the hours of 9am-5PM Eastern Time.